1.Handset is certified to be destruction resistant for military use. 2.Can be used in public, or factory setting. 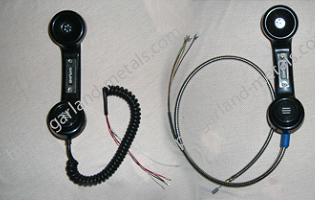 9.Handset is installed with magnets or reed switches. 16.Handsets equipped with steel wires, can withstand high tension greater than 250 KGS. Can be used in chemical,explosion-proof telephones,telephones mines,anti-noise telephones,telephones ship,prison telephones,public IC,coin machine,waterproof and dustproof telephone,self-service terminals and various other communications equipment. 4. Good call transmission of the matching phone. 1. Magnets or reed swit in handset is available. 2. Armoured cord and coil cord are available. We have specilized in designing and producing anti-explosion telephone handsets.keypads,hooks and many other telephone parts for many years,so if you have any requirments,please contact us directly!Thank you!